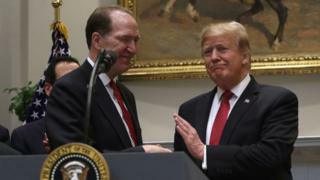 Image caption President Trump announced in February that Mr Malpass would be the US candidate for election as the next president of the World Bank. Mr Malpass said he was "honoured" by the appointment. "Our twin goals of eliminating extreme poverty and achieving shared prosperity are more relevant than ever," he said. The former Bear Sterns economist has criticised the World Bank in the past, along with other multilateral institutions such as the International Monetary Fund (IMF), for being "intrusive" and "entrenched". To become World Bank president Mr Malpass won unanimous approval from the institution's executive board, which has 25 members. The US holds a 16% share of board voting power and has traditionally chosen the World Bank's leader. China is the World Bank's third-largest shareholder after Japan, with about a 4.5% share of voting power. Professor Christopher Kilby, an expert on the economics of foreign aid at Villanova University near Philadelphia, said it is likely that China and other shareholders did not push back on Mr Malpass' appointment as they "recognise that they are unlikely to succeed in derailing the US nominee." "Since they have seen President Trump punish those who stand up to him, they are not willing to fight the US," Prof Kilby said. The legitimacy of the selection process came under renewed scrutiny after Donald Trump's pick emerged as the only candidate to succeed Jim Kim. And he's been an outspoken critic of the institution he's about to lead. In the past, he's described the World Bank as too big. He's said he'd like to lend less to middle income countries like China, which he argues are financially strong enough. And he has challenged the global order. "Multilateralism has gone substantially too far - to the point where it is hurting US and global growth". But while past statements offer a glimpse of some of his thinking, they don't tell the full story. When his predecessor Jim Kim asked shareholders for more money, it was David Malpass who - in exchange for reforms at the bank - helped make it happen. The World Bank critic could narrow the focus of its lending to the world's poorest countries, among other changes. The US agreed to back a plan for shareholders to inject $13bn (£10bn) into the World Bank and its private lending arm, with conditions that aimed to limit the bank's lending, and focus resources more on poorer countries. "For this and other reasons, Mr Wolfowitz was unacceptable to the Europeans and there was push back, including other nominees, for a while," Prof Kilby said. "But as the election date drew near, the fear that this would threaten the European traditional right to pick the head of the IMF led the European countries to back down and accept the US pick," he added.